About this Virtual Run: Runners and walkers have a lot of fun in the sun and need to be aware of the dangers from exposure to ultraviolet radiation. Skin cancer is the most common cancer in the world, with more than 13 million cases diagnosed annually, and one of every three cancers diagnosed is a skin cancer. Over the past three decades, more people have had skin cancer than all other cancers combined, and one in five Americans will develop skin cancer in the course of a lifetime. Help spread awareness and raise money for the cause by participating in the Fun in the Sun virtual 5k/10k/Half Marathon. 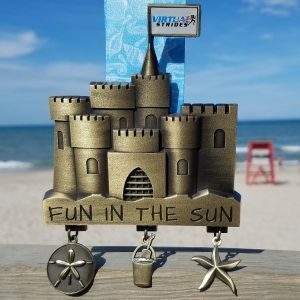 All registrants will receive a custom digital race bib and a 4″ sandcastle medal with three hanging charms. This medal is 3D molded and VERY thick – about three times as thick as most medals – weighing in at a whopping 10 ounces. Run or walk your chosen distance whenever and wherever you want! As always, medals will be shipped after you upload your results or at the end of the virtual race period, whichever comes first. About the Charity: Since its founding in 1979, The Skin Cancer Foundation has set the standard for educating the public and the medical profession about skin cancer, its prevention by means of sun protection, the need for early detection, and prompt, effective treatment. It is the only international organization devoted solely to combating the world’s most common cancer, now occurring at epidemic levels. The incidence of skin cancer can be dramatically reduced through education, behavior modification, and early detection. Skin cancer is primarily a lifestyle disease which is why The Skin Cancer Foundation emphasizes public awareness and education campaigns. A portion of the proceeds from this virtual race (at least $5 from each registration) will be donated to The Skin Cancer Foundation. For more information about this charity or to make a direct contribution, please visit SkinCancer.org.